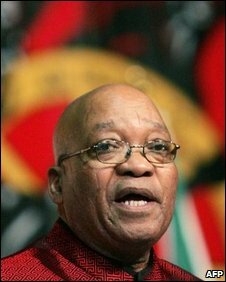 South African President Jacob Zuma says disagreements do exist between the ANC and the trade union federation (Cosatu) - one of its main political partners. The ANC recently angered unions by opposing unions in the military - and Mr Zuma restated that position in his address to Cosatu's national congress. But he called for unity, saying the ANC was a "broad church" that could disagree without being disagreeable. Mr Zuma relied heavily on union backing to get him elected earlier this year. And Cosatu is believed to be the biggest of the nation's three union federations. Mr Zuma called for summit talks to discuss their disagreements. "Let us continue to work for the unity of the working class, the unity of the Alliance and the unity of our people," he said to a crowd of about 3,000 delegates. The BBC's Pumza Fihlani says the unions and the government have not always agreed on the measures needed to improve the lives of those they represent. One of the recent sticking points has been the defence ministry's call to ban unions in the military. Troops staged a violent protest in August - about 3,000 of them marching to Mr Zuma's office in the capital Pretoria demanding a wage increase. Mr Zuma announced on Monday that the ruling ANC's National Executive Committee was "in favour of the deunionisation of the military". Mr Zuma told Cosatu that "alternative means must be pursued" to improve soldiers' working lives. Cosatu supports soldiers' right to strike. But in an apparent effort to dispel rumours of disunity, Cosatu's President Sidumo Dlamini said on Monday that the ANC was "now back to its right owners". At the union's last congress in 2006 it openly backed Mr Zuma as the next president of the ANC, so putting him in the running to replace then President Thabo Mbeki. Many analysts said at the time that the fierce battle within the ANC to oust Mr Mbeki had damaged the party. But talk is already rife about possible successors to Mr Zuma. The president told Cosatu delegates that measures needed to be put in place to avoid a similar succession battle. "We know all know the impact of an ill-conceived and premature succession debate," he said. "It is therefore for this reason that the NEC has agreed to develop a code of conduct on lobbying for use at the right time during elections."